AW, the heck with it. As a heavy reader, I'm not always sure what makes me run to this blog to post about books sometimes and what makes me just read other times. I'm sure it has something to do with being moved by a read, but there is more to it than that because I read some really enjoyable books. I knew I had to write about it here. 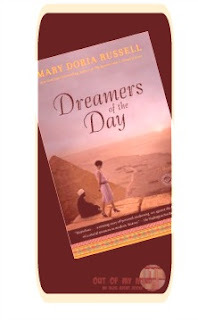 I began researching some of Russell's other titles and chose to read a historical fiction book called Dreamers of the Day: A Novel and now I know I have to read everything else by her! And I can even partially say why! She is a true lover of language, a student of culture, an anthropologist, a skeptic, a polemicist, a contemplative mirror, an appreciator of complexity, a pragmatist, a lover. I'm going to give this book a little bit of thought and be back soon to say more. Stay tuned. Furthermore, I am friends with Mary Doria Russell, the author of this book, on Facebook. She and I spent some time talking about the writing of this book and, because she feels this book didn't get the readership that it deserved. I agree with that. So, I'll be back with more!